The way we buy games is changing, with digital sales slowly but surely taking over from physical. That means the landscape of games retail is gradually shifting, and all stores - from the big to the small - are feeling the pinch. With that in mind, we're sad to report that UK store Extreme Gamez - which is our local indie and also Rare's - is closing its doors after 24 years in the business. We visited the store recently to talk about its future following a difficult Christmas period, and were told that there was a strong possibility of closure at some point in 2018. It would seem that point has come sooner rather than later. 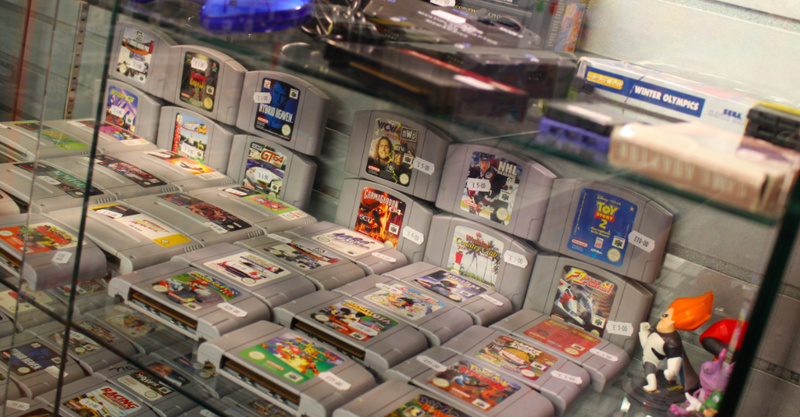 Extreme Gamez was born in 2000, but the store's history goes back to the middle of the '90s. Rare - which began its life just a stone's throw away from the store in Ashby-de-la-Zouch but is now situated down the road in nearby Twycross - has a long-standing connection with the shop; during the Nintendo years staff would pop in to purchase copies of Rare games to put inside the company vault. Even now the connection remains; signed Yooka-Laylee cases can be seen inside one of the store's glass cabinets, and Playtonic staff are regular visitors. The final day of trading will be May 19th. We've been told by the owners that there's a chance the retro side of the business will continue online in some form, but that "a brick and mortar store just isn't viable in this day and age". Speaking from a personal viewpoint, we're incredibly sad that this store is going under; set in an historical market town in the rolling English countryside, it's a million miles away from your typical busy city setting and presents a truly unique shopping experience - but perhaps that's part of the problem. Without a high footfall smaller stores like these are always going to struggle, especially with the market heading to digital. If you're in the midlands we urge you to pop in and pay a visit before this incredible store closes for good. It is a shame, but they were rather rural, I looked them up after the last article, but unless you have a car or live there you aren't getting there. They had a video game store? Bummer. I enjoyed NL's reporting on the place. @bluemujika In terms of transport links Ashby is actually quite well served, it's right next to the A42 so is within driving distance of Birmingham / Nottingham / Leicester, and is only a short drive from the M1, the UK's biggest motorway. @JHDK Thanks, I'm just glad we got to do it before it closed. We'll look back in the future to this time and realize we could have stopped this but we chose not to... because we're lazy and doing things is inconvenient. Developers are dying to sell you trash like destiny 2 full of microtransactions and by the time you notice it's too late... you're not getting a penny back, enjoy your digital future gamers. @Rika_Yoshitake Not sure I get what you're getting at. I don't buy microtransactions. I don't buy digital games (unless there is no physical version). Instead I buy all of my games (I only buy single player games) via Amazon. Why? Because my job as a consumer is to buy it the cheapest I can find. Whilst I'd love to support stores like this - if they can't offer it as cheap as online, it's not worth the time and inconvenience for me to get there. Yeah... it's sad, but from what I saw in the previous article that you guys did on them, their prices sure weren't competitive. In fact: a lot of their prices for games and consoles were simply too high. If you keep selling at prices that are above what is the current rate at almost every other shop, and don't offer a good online alternative like a web shop, then you've effectively put yourself out of business. It's a real shame, because I do prefer brick and mortar shops over web shops, but they should either put in the money/effort to be competitive, or the ultimate and sad conclusion is that there simply isn't a place for them anymore in the business as it currently is. Well that's sad. I always find shops like that to be very expensive, or at least that's been my experience here in Ireland. @coxy100 The second publishers can force digital only that's all amazon will offer. If you think Amazon is your savior, boy are you wrong. @Rika_Yoshitake Where did I say they were the saviour? However whilst they offer the exact same product as a brick and mortar store - and they offer it cheaper - I will always be purchasing from there. I haven't bought a digital game yet, I don't plan to, either. Local only as well. @Rika_Yoshitake While I am a fairly old gamer and so enjoy having shelves filled with games, blu-rays and books etc, I totally understand why people want to unshackle the enjoyment of games and movies etc from having to own and store (and in the case of a portable games machine - carry around) lots of physical media. Too many people criticise young people for not wanting to really own their games, film and TV shows, but is not being hung up on possessing things really a bad thing? And is not producing tonnes and tonnes of plastic games and DVDs every year, only for a large number to eventually end up in landfill, really such a bad thing? I fear this is the trend. Last year, three of the four used game shops in my town closed. This included one that had been in business for 21 years and another that had been around in various forms for over a decade. I stopped buying physical retro games years ago when the prices shot up. $50 for Super Mario World (loose)?? Uh no. $225 for Earthbound (loose), hell no. The story goes on and on. I don't want to see the local shop close down but I won't waste my money on their ridiculous prices. I complain about their prices every time I go in there (which is rare these days) so that if they ever feel the need to make changes, someone has given them an idea where to start. Chances are though, they are stubborn enough to go bankrupt before they lower prices. @BionicDodo Do you want to own the things you buy or just rent them? Let's hunt some Oldies games from Ebay or Amazon or Playasia ! Both Sony and Microsoft are already setting things up for a digital ONLY future. Especially MS.
Nintendo is getting there. Slowly but surely. The market that will be more resistant to the idea will be Japan. @Crono1973 The concept of ownership, or obsession with it, is what I am talking about. I buy a game to play it and enjoy it. Maybe I will play it again another time, even years later, maybe not. I buy a film to watch it and enjoy it. If a physical version of a film costs the price of three rentals and I only ever watch it twice then what value have I really got from my ownership? That's before I even get into the fact that I have a backlog of games I will probably never get around to playing and I have purchased Blu-ray editions of films I never got around to watching on DVD and am now eyeing up 4k UHD Blu-ray versions of films I never got round to watching on blu-ray. A cartridge can eventually stop working (although they are generally very robust), an optical disc very much can become scratched or degraded and stop working. Nothing is forever, especially our time. My main reason for buying physical games these days is that they are so often much cheaper from Amazon than they are from the digital store. Which is ludicrous. I still buy lots of physical media, my point here is that many people are starting to be happy with services like Netflix and the Xbox Gamerpass and is their requirement to have media to enjoy, rather than owning a shiny shiny thing, really such a bad development? Too expensive and ultimately not having a website to buy from was their downfall. This needn't have happened if the owners were switched on to the current retail model. @BionicDodo People giving away ownership with nothing in return is not a good thing. You ask what value a physical game has if you never play it again. You can sell it and now I ask you what value a digital game has if you don't play it again and you can't sell it? Its sad when this happens; my local indie game shop up North closed its doors last year. Having moved down to West Kent recently I’ve yet to find one. At least there’s always Level Up in Canterbury who miraculously supplied me with my NTSC-US PS2 and sub-£100 Super Metroid Big Box. Actually its been more than 2 months since I spent money there!! Heh heh, who knew that a brick and mortar store called EXTREME GAMEZ might have a limited shelf life? I read the word game and for whatever reason thought that GAME the entire retailer chain was closing... now wouldn’t that be something? This makes me sad. I used to visit this store regularly when I worked at Rare. I actually stayed just a few mins walk away from it. It was a great little game store for picking up cheap retro games. Real shame - I don't get that way too often so can't drop in but there is something about retro game stores that are almost a validation of the hobby. I also think that cheaper second hand game stores, like CEX are eating into profits. I'm planning a trip to the one in York soon though where I am hoping to pick up a few bits and bobs. It's a shame to see stores like this close down. Unfortunately it's a reflection of how society is changing. I still prefer brick and mortar (Does that make me old-fashioned? ) and buy physical when possible, but I have started gravitating towards stores (mostly online) with cheaper prices. @SLIGEACH_EIRE Agreed. Not that there are even many like that over here in the first place (other than The Rage in Dublin). @Crono1973 You make a very good point, and my examples do stand up better for other media than for games. That said, the cost savings of a Netflix like system, like Xbox Gamepass, and the huge discounts often offered in sales on the PS and Xbox online stores make all digital so cheap on those platforms (if you are prepared to wait a bit) that any loss of resale value should not necessarily be factored into the value calculation, or should at least be balanced against the convenience factor. All that said, many people on this site would happily pay twice as much for a physical version compared to a digital release, so they are clearly not concerned about resale value. I'm not arguing that people should all go digital and stop buying physical media, just that a lot of people are very dismissive of those who prefer digital media, especially those dreaded 'millenials', when maybe they should consider all arguments before being so critical. Stores like that take me back to what got me into gaming in the first place. Love that the comments sections in articles like this always make it so simple. If only they had sold their stock online and undercut Amazon they would have been fine. The bigger picture with digital distrubution is that our access and choice will be totally controlled in a few years and that will be a sad place to be. @BionicDodo We have considered the other side. 1) They praise not having to get up to put a disc into a console, laziness is not a valid reason to give up consumer rights. 2) They don't seem to care that future access to a game will not be in their hands, they only care about now. In a digital future, there will be no driving to a game store to buy a copy of a 10-20 year old game that others rave about. Can you see a future where a current game will be taken away because a remake is coming? An all digital future is coming if we just roll over and accept it. It may still be coming anyway but the people advocating for an all digital future may come to regret it when every copy of any game is given and taken away at the whim of publishers and OEM's. Effectively theft when a game they bought becomes unavailable. How many people didn't play Chrono Trigger until 10-20 years after it's release? Any other arguments I should be considering? @Crono1973 You're thinking way too much into this. Discs rot eventually and stop working, HDD fails, flash memory fails too. All electronics are due to fail with time. And besides that, we are going to die too, so having or not a game available forever is hardly a priority. Nothing lasts forever. If they want to have everything digital, they have the right to do so. Big shame, but like most retro game stores the prices are too high, I can understand the price tags, but the prices make CEX look cheap. @coxy100 and others who only shop through Amazon you are eliminating retail competition. I understand you are finding yourself the best deal, but Amazon is not going to continue cutthroat pricing when all of their competition is gone. They can subsidize their business using AWS (cloud computing) that was subsidized by tax dollars as they slowly dismantle their competition. I used to feel the same way about Walmart and now they may be the only survivor against Amazon. @Devlind Discs and cartridges/cards last longer than any digital store. Let's go back to the NES, are NES carts from 32 years ago (1985) still working? Do you forsee any console digital store lasting for 32 years? This (disc rot & humans die) is a weak argument that people should stop bringing up. @Crono1973 Depending on the POV, every argument has the potential to be weak. And well, we don't know if either of us will last for another 32 years. It's great you have such strong opinions about this topic, but I recommend you just to play and let everyone else play the way they see fit. @Devlind Actually, we need to be pro-active if we want to keep physical media. @Crono1973 I completely agree with everything you've said so far. Although with the small nuance that I do believe that not all pro-digital people are as oblivious to those facts: they simply prefer the convenience and a lot of them also don't care about being able to play the same games ten years or longer from now. Having said that, I do own quite a few digital titles, but mostly only because of my Xbox Live subscription. My preference is physical, though. No game needs to last forever, another misunderstanding that people often seem to bring up, also in this discussion here, but it does need to be in the hands of the gamers for them to be able to have maximum ownership of that which they have bought with their own, hard-earned cash, instead of being at the whim of developers and publishers who can basically pull the plug whenever the hell they want, like you so correctly stated. And sure, even with physical games, publishers can discontinue support or online gaming, but that doesn't mean that the entire game will be unplayable, and by that time, hackers could potentially offer patches, or (as has already happened dozens of times) hobbyists could start dedicated communities and servers for certain games all by themselves, so that people can still play online if they'd wish to do so. In any case, if people care about ownership and maximum longevity, then physical should definitely be the preferred medium. If they only care about convenience and the here and now, then digital is probably the way to go. @Devlind He may have a strong opinion, but he also most definitely has a point. A lot of people just don't consider these things. It's fine if you truly prefer digital, but that doesn't mean that you shouldn't take a minute to think about what that means exactly, especially in the long run. Sad, but it was to be expected. Maybe they should have warnings on each digital purchase that says: Warning: This purchase could be revoked at any time and for any reason. Also, this purchase may contribute to the death of physical media and the consumer rights that come with physical media. Kind of like the surgeon generals warning on cigarettes. @Crono1973 Then do that by buying the content you like physical. Buy it for you, your family and friends. That's the only thing you can actually do to support physical media. You probably already do so that's great, but don't try to apply that to everyone else, and trying to change that probably has the opposite effect. People don't like to get lectured, so they will likely ignore you and continue to play as they like (you'll probably do exactly that after reading my comment). Unless they come across a bad experience doing so, I don't see how they'll change their opinion. For the record, I like all my games physical. I have tons of them, but I would be lying if I said that digital doesn't have its perks. @Devlind You act like we aren't here on Nintendo Life to discuss issues related to gaming. Why are you afraid of pro-physical people voicing their opinion? @ThanosReXXX I didn't said he didn't, I just said (or implied) that people have different preferences about this and that trying to change that is almost impossible if they are comfortable with the way they play. @Devlind Well, I don't know if you read my entire comment, or only the part directed at you, but in it, I clearly stated that I'm perfectly fine with it, and that each of us should choose what he or she prefers, but it IS my absolute belief that people should do this for the right reasons, and with a full understanding of what it all entails. Customers should dictate the industry, NOT the other way around, which is what definitely WILL happen, if we let them continue the way they are going. For people like me and @Crono1973, that'll probably mean that we won't be supporting any system that will only offer digital games, for the very reasons we described. So, if people understand all this, and STILL choose digital, then I would like to think that it is a well-thought out choice, and not one simply based upon convenience, not caring for anything happening to their games in the future, or because they seem to think that this is just the way it is and they can't do anything to change it, while they actually can. @Crono1973 I'm not afraid of that, I just said that doing so would likely have the opposite effect, just like when you talk about religion/politics/sport teams. It doesn't matter how better your preference/option is (in your POV of course), people will defend theirs just to not get lectured by you. People don't change opinions that easily unless they're hoping to, just like when you read reviews to decide whether you buy a game or not. I don't know if I'm making my point clear. @ThanosReXXX You got me there, I just read your comment after you mentioned me. About consumer dictating the industry, while that would be optimal, most of the time it isn't like that. If that was the case, people would still ignore HD TV's because their CRT's worked perfectly fine, or new highend cellphones would still have a jack port, or we would not have the Nintendo Switch since home consoles working only at home was what we expected. In reality, we are just following trends, the industry is just giving us the impression we're deciding. @Devlind Haha, no worries man. Just thought I'd point it out to you, for completeness' sake. And even though we think physical is better, maybe we should replace 'better' with more valuable or more future-proof, which is not even an opinion or point of view, but a cold, hard fact, as already explained in the previous comments. Although developers/publishers can always apply certain rules/restrictions to your games, they can ultimately only do so much to physical copies, whereas digital copies can be remotely disabled, or if they choose to do so, even deleted. I can imagine and understand that not everyone is a collector, or has the space to store all these games, but other than that, the pros by FAR outweigh the cons, and even though I do agree with you that digital has its perks, it has less pros than physical, and they also weigh less heavy than important things like ownership, trade-in value and longevity. @Devlind Preaching to the choir, my man: I'm a sales & marketing professional myself, so I both create those illusions myself, and as a result, I can see right through them, and tell others how to do the same. It's basically all smoke and mirrors, with just enough of a benefit to make people believe, in a lot of cases. But there are true revolutions in tech that really offer us something better, and HD TV is one of those things. It's not so much that CRT didn't work anymore, it's just that the medium of TV and movie making advanced and so should home screens, so that the public can also benefit from these advances. And that following trends bit is actually exactly what I was talking about, only I interpret that as people shrugging, laying down and taking everything as it comes, accepting that this is "just the way it is", although luckily, not all people are as accepting. @ThanosReXXX That's precisely what I'm talking about. Of course HD TV is better than CRT, but my point was that people was forced to actually change. You either get an HD TV or lose future support. Nowadays it's hard to find a device that is compatible with a CRT TV. Where I'm going with this is that someday we could come across something in a similar fashion with digital games (consoles not supporting physical media anymore). If all 3 big competitors go in that route, we would be left with no options, so we either follow it or just quit gaming altogether. PC went almost digital only years ago and it's working fine for them, I can't see why consoles would never step into that direction. We are far from that of course since developing countries usually help to slow this process. I don't want it to happen, but I can't say that would be impossible, but that is just my opinion. @ThanosReXXX BTW, I clicked report by accident in your comment, my pc was going batnuts. I'm sorry. As for where the industry is going: probably more and more digital, but as long as there is a demand for physical, the industry has no other choice than to comply, unless they want to lose millions of customers, and money, which is the main reason they're making this stuff, so they wouldn't anger their target audience too much. And THAT is the control that customers can STILL exert over companies and initiatives like this. If only more people would realize this. It might make them understand that they really don't have to except just anything that gets thrown at them. It's the whole voting with the wallet thing, among others. Just look at how Microsoft had to do a 180 on their Xbox One introduction. That certainly is a prime example of customer power. And there actually is one option left if all companies go full digital: become a retro gamer. I still use all my old consoles: N64, GameCube, Dreamcast, Wii, Xbox 360, Wii U and I also still have all my Nintendo handhelds: Game Boy Color, DS Phat, DS Lite, DSi XL and a 3DS XL. And besides that, three models of the Amiga home computer, and an old game PC. All in all, more than enough to keep on gaming until I leave this Earth for good. I might not be able to play the latest and greatest anymore in that case, but I'll still have a wonderful time regardless, and the industry will have forever lost a VERY good customer, because I buy quite a bit of stuff in general. Anyway, full digital is still quite a few years off, certainly for Nintendo. The other two might give it a go next generation, but they'll change their policy as soon as the customers raise their voices, and they most certainly should. @ThanosReXXX Nintendo surely would be the last to go full digital (they could surprise us being the first ones, I don't know). If Sony and Microsoft can fix most of the short comings of digital gaming (like guarantee that we're going to be able to play the game without losing the ability download it again or letting us back it up in other devices), I could see they trying it next generation, although I don't think they're ready to drop completely physical releases either. They could start selling boxes with download codes. It isn't far fetched, Nintendo has already done that. @Devlind So your opinion is that nothing should ever be discussed because it may strengthen the views of the people on the other side? I would say that not discussing leaves those views unchallenged. I'm not sure it can be entirely blamed on digital distribution. Things like Amazon have to factor into it as well. I buy physical whenever a game is available that way, but I'm guilty of rarely going to a store to buy it. There's no game store within walking distance of me, it's about a 20mins drive to the nearest one, so it's just too easy for me to buy it on Amazon and it shows up at my house 2 days later. Besides I don't know if digital will completely take over. People thought digital music would take over completely, but CD's still sell and vinyl made a comeback (probably not a fair comparison as there's no discernible difference in quality between digital and physical games, arguably unlike music) . But the point being that a lot of people like having their media in a tangible form. You also have to consider that many (more than you might think/hope) games won't run once the servers or updates that silently authenticate and patch them are gone for enough time. It doesn't matter if they are cartridge or digital. This definitely includes Nintendo games. Nintendo and other developers change the encryption keys for writing to the required cache drive partition in timed increments to thwart piracy as well employing a few other time based tricks. When this is no longer updated, even carts will not work. By accident or design, this can keep the game from ever running again, for example. After the Switch e-shop goes down, it is entirely possible digital AND cartridge games will not work anyway. The system likely has a timed self destruct for DRM authentication. So that comparison to NES carts does not really hold water in this day and age. And as you said, that is unfortunate. Hacking the console, if it still works, might help, but, then you could just download the inevitable pirated versions. Digital vs. physical really does not matter as much anymore as you might think because of DRM practices put in place the last few years. Some games simply have an invisible self destruct built in, and will no longer work. @Kiyata It's also because these retro stores are too expensive. Even people who want to play physical copies of retro games get discouraged by the ridiculous prices and just use an emulator and roms. @Thunder_Pilot We really do need some consumer protection laws put in place. @Crono1973 You are challenging them, but not changing them. It is futile in the long run, why bother? Unless the discussion is held for the need of a solution/answer by several parties, this so called discussions (or for this matter, pros vs. cons) are pointless since no one here (for what I've seen) is looking for that. @Thunder_Pilot That's true. For example, when the Wii U servers go down, if you buy a physical copy of Splatoon, you will be stuck with a incomplete game. The same with many recent Nintendo games, from BotW to Xenoblade Chronicles 2. Would they be playable? Probably yes, but never complete (that is just assuming there's no hacking involved). @Devlind Why are you here if you are against discussions? @Devlind Anyone (not me) who buys games that require a server for basic gameplay knows their game comes with an expiration date. @Crono1973 Well, you're putting words in my mouth now. I've never said I was against it. I haven't seen anyone here interested in formally discussing this matter, just a couple of people listing the perks of physical over digital and the other way around, immediately diregarding opposing opinion. What we had was more of a conversation than a discussion, I just exposed my point of view on this matter from the very first comment. @Kalmaro The store wasn't owned by Rare, it's just a shop local to their HQ. @Devlind What are your rules for when it is ok for people to discuss their opinions on a discussion forum? No surprise, the big brick and mortar stores like Gamestop started mercilessly forcing the independent shops out of business years ago, making it nearly impossible to survive except for some exceptional cases. (Such as Extreme Gamez.) The only independent shops left involve used wares only, no new products. So it's extremely difficult to survive without a real online presence at this point. Hopefully those executives at Gamestop get their comeuppance someday. Gonna still buy physical games whenver possible, so I can actually see my collection. Good luck to y'all going fully digital when Nintendo doesn't even have cloud saves to keep your data around. @Devlind Splatoon wouldn't even be playable, not even Octo Valley. Apparently, I only work nine miles away from the store so may check it out! Sad to hear and I feel their pain. Things aren’t much different in (instrument) music retail where I work. @Folderoll I am not the one telling other people not to give their opinion. @PigmaskFan Wait, really? I thought at least Octo Valley and local multiplayer would be playable. Figures. @Crono1973 Well, I didn't make the rules so it would be arrogant to call them "my rules", but I guess we can start (as a requirement) with two people that actually want to have their opinions tested and are willing to change them if the opposing opinion is, in fact, after evaluating it, better. I said before people aren't willing to change just because you say something is better unless they want to (just like when they're looking reviews of a game/movie/book/etc.). No one here is looking for that, I've only seen people expresing their opinions and mark opposing opinions as wrong, no one is discussing them at all. If you find someone that is willing to discuss with you about this topic, go ahead, but at the moment you only have been doing exactly what I said (expresing your opinion and mark opposing opinion as wrong). I'm not trying to be rude or anything, so please don't misunderstand my comment. You're free to do give your opinion, I just tried to point out that trying to impose it as correct to others is futile. @Devlind If my opinion were truly futile, it wouldn't bother you as much as it does. @Crono1973 You're assuming that. I've been repeating myself a lot, but as I said, I just wanted to point that out. Nothing more, but probably less. Yes we do! And this is a issue that's going to come up more and more. Right! And with initial builds being the ones shipping on cartridge, then patched on release day, some games may even have bugs that block player progression or game operation entirely. This worries me when I see that happen. I do miss the days when a game HAD to work before shipping the cartridge/cd/dvd/media. Unfortunately, some games that do not appear to require online may not function either. For instance, Zelda BOTW checks to see if you have purchased and validated your expansion pass on game load. If your savegame includes things you have done in the add-ons, the save will not load once the store is not there to validate them after so many times. And the Switch encryption issue may not let any of them work anyway. The Wii U did not employ this scheme. The customers who legitimately purchase their software are always the ones who are hurt in the end by DRM. "PC went almost digital only years ago and it's working fine for them"
The difference is nobody has a monopoly on Digital sales of pc games (as close as Steam might come). Microsoft, Sony and Nintendo want to go all digital because it will force all consumers of their hardware to also buy software directly from them at a price they choose. Monopolies are never good for the consumer. @electrolite77 While that's true, you could still buy the download code from a retailer, which could control the price.